As you know, my in-laws moved into our Beloved Foreclosure after we moved into the 70’s Landing Pad. The Circus of course got a new room here, but she also got to keep her old room at our old house. So now, the child has two rooms of her own literally within walking distance. As if she wasn’t already planning for the global shutdown of Toys ‘R Us, she now has two rooms that she can fill with stacks and stacks of toys. While the Circus’ wanted to paint her entire old room blue, her Gaia (Grandma) and I weren’t too sure about that. So instead, we picked out three blue colors that worked well with the gray we were painting in the rest of the room and let her choose which blue color from those. And I have to say, she did a pretty good job choosing a blue. Disclosure: This post is sponsored by FrogTape, however all opinions are 100% mine. 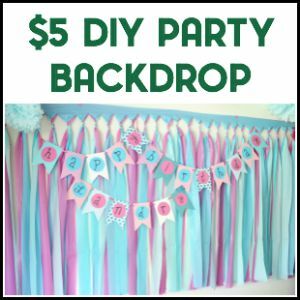 Affiliate links may be contained in this post. 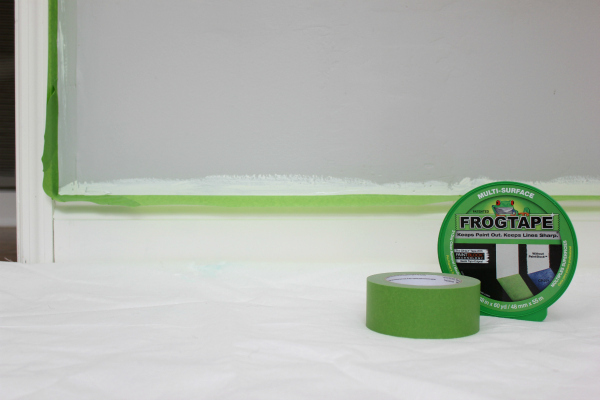 FrogTape – I used both the green Multi-Surface and Delicate Surface because I had to tape some walls that were freshly painted. 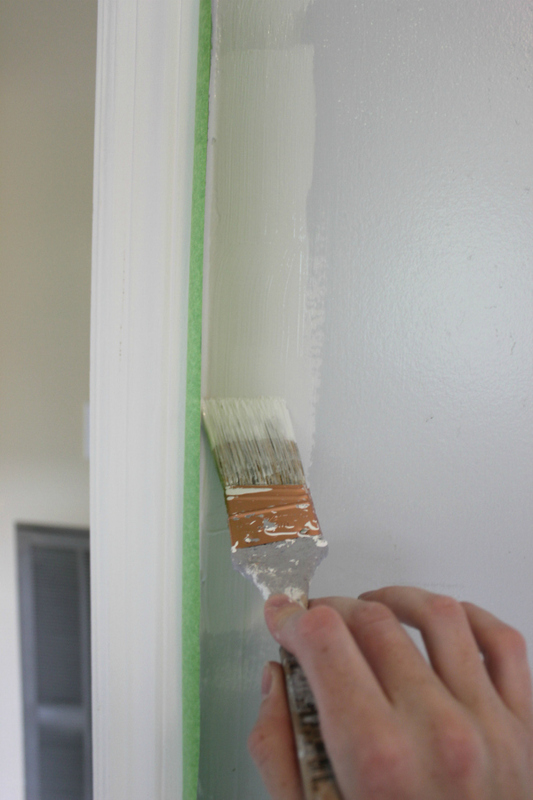 Prep all your walls by filling any nail holes with spackling. 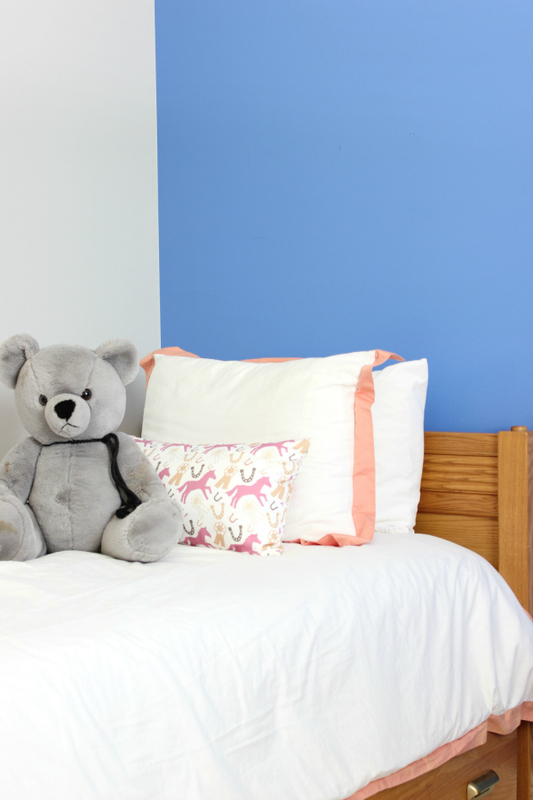 If you’ve got some areas with dust on the walls, wipe them down with a wet cloth or Swiffer cloth. You can see where we spackled holes in the photo above. 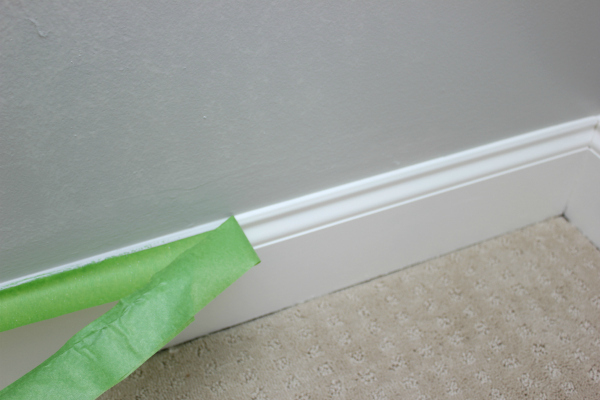 Before painting the walls, we also gave the baseboards a fresh coat of paint as well as the newly added crown moulding. If you need to touch up that trim, now is a good time to do it. We didn’t tape it off since we knew we were painting the walls. 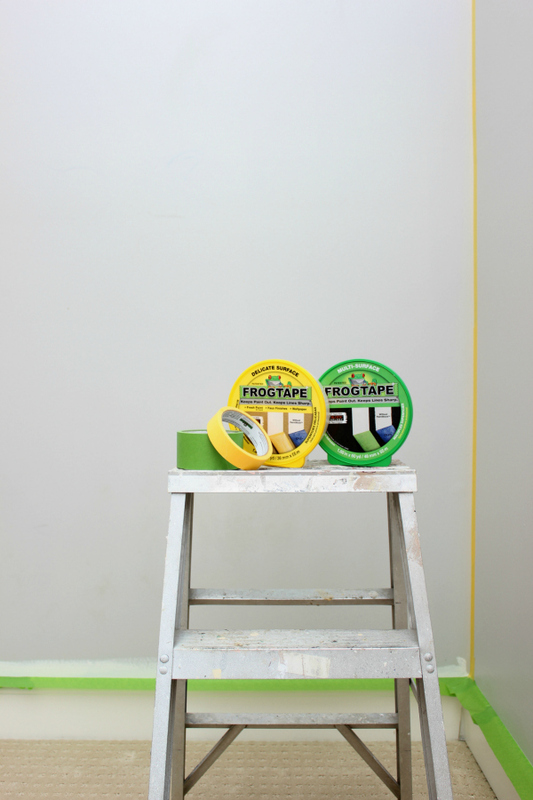 Use FrogTape Multi-Surface to tape off the trim anywhere you will be painting. 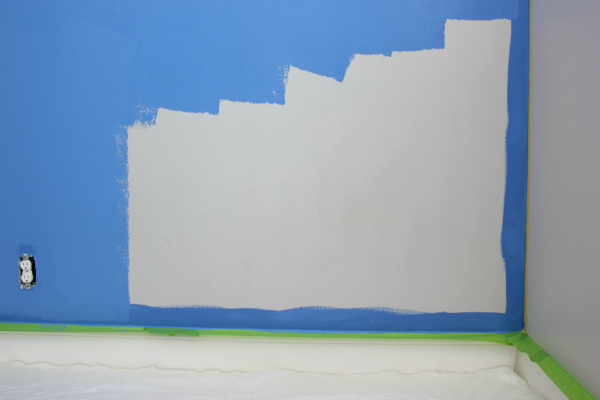 We started by painting the main wall color, the gray Dolphin Fin color, onto all the walls with the exception of the wall that would get the blue. When I tape trim, I like to use the widest FrogTape and leave the outer part of the tape (the tape not closet to the wall) not taped down. So, I just firmly apply it right along the top of the baseboard and edges of the trim, but leave the outer half kind of standing up. Does that make sense? You should be able to see what I’m talking about in the picture above. I’ve found that this gives a little extra paint splatter protection. Start painting. Do your edging first. Come back and roll on your paint. 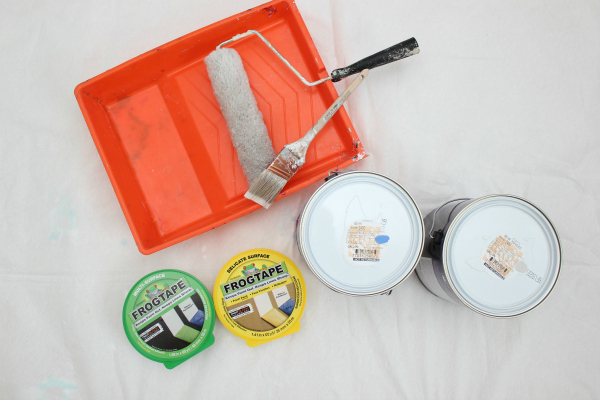 As soon as you’ve painted your last coat on, remove the FrogTape. 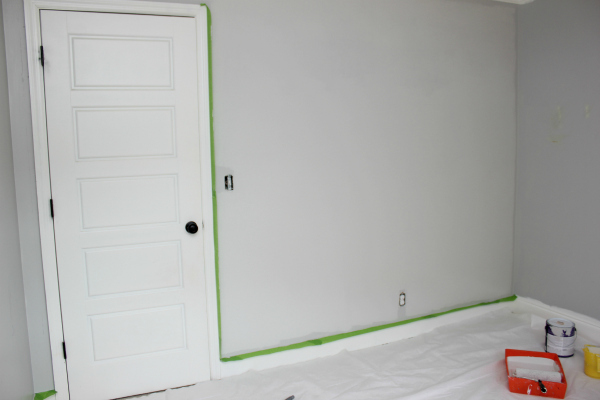 Let the walls dry for at least 24 hours before doing your accent wall. For the accent wall, once more tape off the trim first. 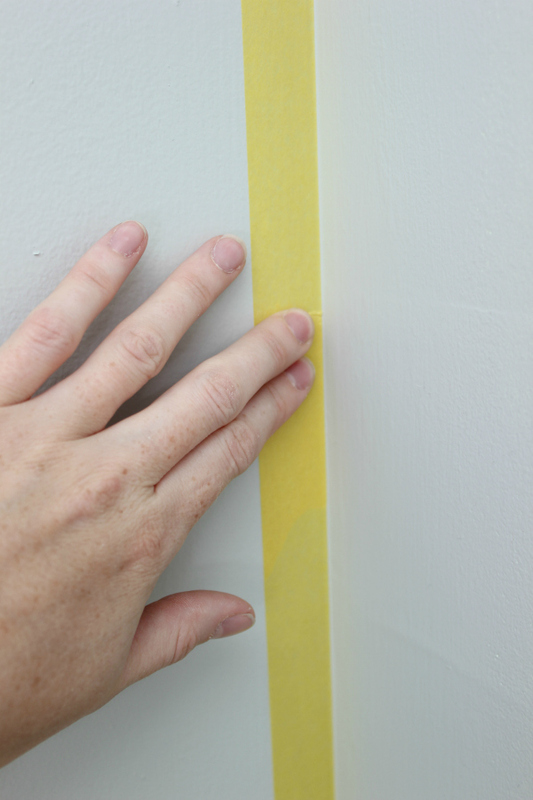 Use FrogTape Delicate Surface along the edges, right in the corner, where the accent wall will meet the other walls. 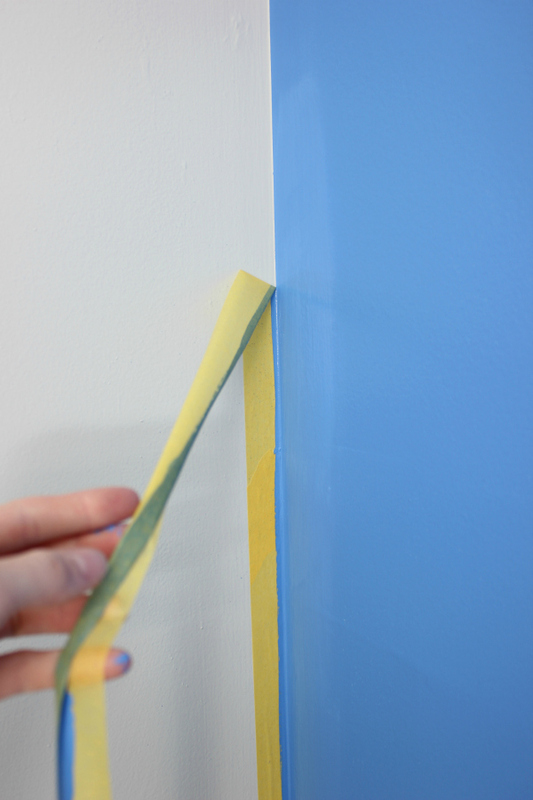 You want to use the Delicate Surface FrogTape because of how fresh the paint on the other walls are. Firmly press the FrogTape down along the edges with your fingers. 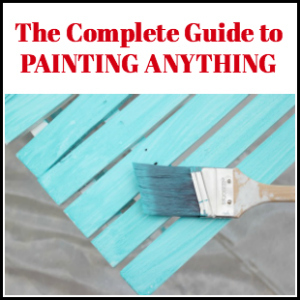 This helps to ensure that there isn’t any paint bleed. Paint your accent color on the wall. Once again, edge first and then come back with the roller. 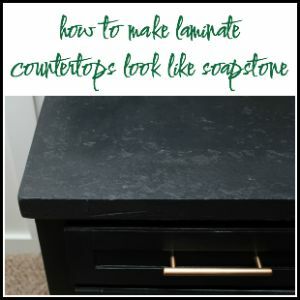 And again, after painting your final coat of paint, remove the FrogTape. Seriously, how cute it that room?! It’s also just enough blue for all of us not to have our hearts shocked back into rhythm when we walk in the room. 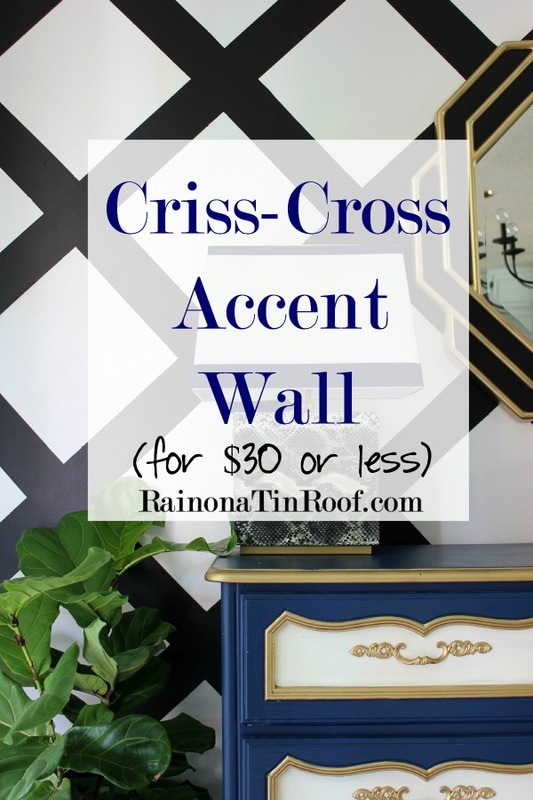 Looking for more accent wall ideas? Well that just so happens to be my specialty…. Very cute room! And that sure is a pretty shade of blue! Thanks, Randi! I think it’s a cute room too – she really loves it. I like the blue too! So sweet she has her grandparents in walking distance now and her own blue room there. 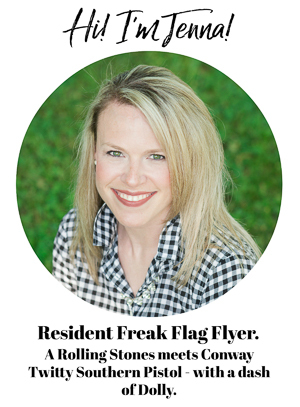 Lucky little circus…..
She is one lucky girl, Lisa! Thank you! Circus is a very lucky little girl who has good taste! We think so too. 🙂 Thanks, Paula! Perhaps she is like her Granddaddy & likes the color Blue. Looks like one of the shades you had was what I call Ford Blue, which is my favorite. Tell her Granddaddy & Ta Ta will have Blue room just for her when she comes over to spend overnight, week, etc. I am so glad to see you posting! Well, I’ll be a monkey’s uncle. It IS the perfect blue ever! I suspect she is a clone of her Mother!(?)! Isn’t it though?! Oh heavens, don’t say she’s a clone of me, Pam! We’ll all be in trouble! Love the blue, and also the gray walls, nice!!!! Thanks so much, Sara! I think it turned out to be a pretty good combination as well! Oh how I wish I was a smart as you. 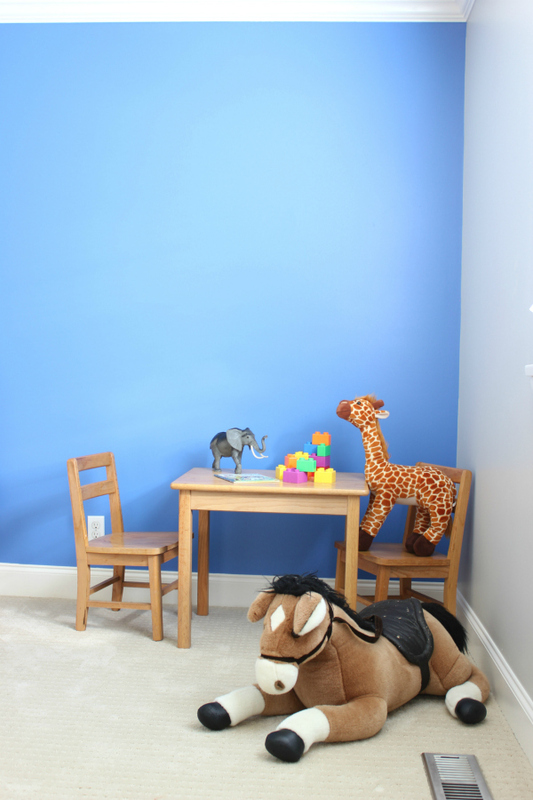 When my son John wanted his room painted many years ago, he wanted blue also, but a very dark navy. It was horrid, but he loved it. It could have worked for me if I had thought to paint the other three walls a more neutral color. I love Circus’ reaction and she did pick a pretty blue. Oh trust me, Kitsy – I’ve been there! 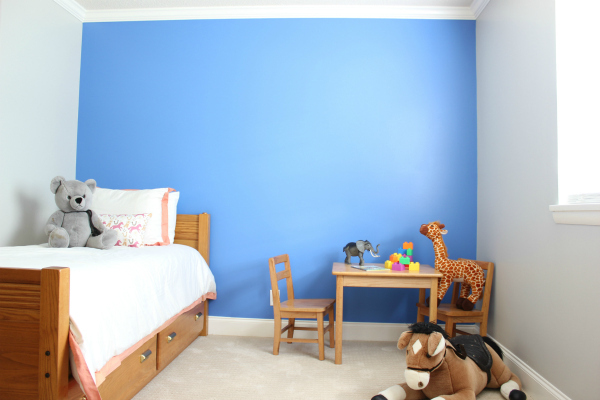 I was the one who thought painting the entire room one color would work well though – I was wrong! 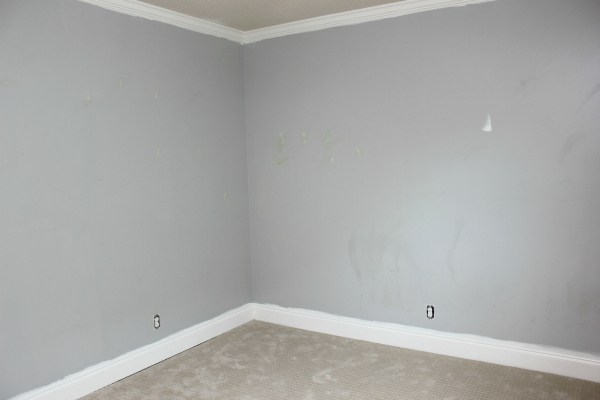 Did u use a flat or satin paint for the accent wall?